It is SNOWING – YIPPEE! oh how I love the snow, my children love the snow and did I tell you I LOVE the snow, sorry yes I did . 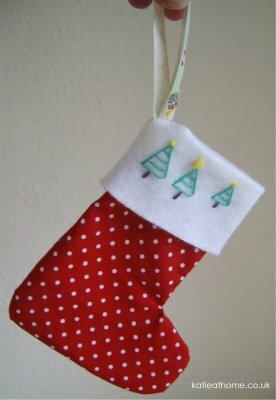 . . so I thought it was time for a Christmas craft so here we go – Christmas Crafts – Making a Christmas Stocking. Now as a child I LOVED MY Christmas Stocking – it was so exciting. As the Christmas prep is gathering pace I am sharing with you a craft project for my Christmas Stocking. You can use these little stockings as tree presents or make a garland or as I did as a little gift tag. First of all cut out your stocking(s) and embroider a design on your cuff if you chose to. . . And there you are your stocking is finished. What are you going to with yours? – Tree presents, gift tags . . . I stitched names on to some of mine, I am going to use these ones as gift tags, and place some candy canes in them,then I gave them to my nieces and nephews a little something to hang on the tree. This was a project I did last Christmas, so have fun with it and yes we still have the stockings as does everyone I gave them to as presents. . .